When Mohinder Amarnath got Malcolm Marshall out on the 25th day of June in the year 1983, history was made. After a few Zimbabwean hiccups, Australian demolition and a semi-final win over the reigning champions, India was a worthy winner of the prudential world cup. From being underdogs to being champions. Kapil Dev holding the prestigious cup is one of the most cherished pictures to every cricket lover in India. The playing eleven were the established heroes in India for a certain boy named Sachin Tendulkar. Little did this boy know that come 1989, he would be well on his way to becoming a little more than just a hero? He would be considered a god. 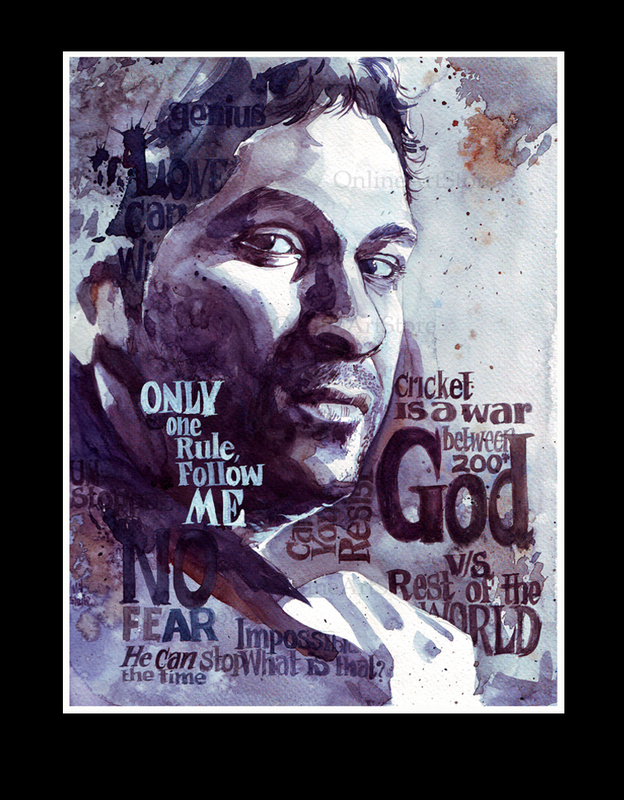 Sachin Ramesh Tendulkar has been and still is one of the most energetic and talented players on most fields. His command on the pitch is one un-matched by any other cricketer alive today. Be it a twenty-twenty match, an ODI or a test. He has guided India to victory and honour for almost 22 years. Any player with that amount of talent and playing for that long a time could be considered a legend, but not at par with Sachin Tendulkar. Tendlya, as the people in his neighbourhood address him, is a personified level of class, stroke of genius and a true gentleman. There has never been and there will most probably never be a human as strong as this man. Fighting every type of criticism and rising above his weaknesses is one of the few things you can learn from the master blaster. Consider any other athlete of his popularity in the world. He would either be cheating on his wife, sleeping with waitresses, running over homeless people, doing drugs, having illegitimate contacts et al. Imperfection and controversies are not words ever applicable to this man. He sponsors the education of 200 unfortunate children, has raised funds for cancer patients, helps build shelter for the downtrodden and funds numerous other charity organisations. All this, not as a mere publicity stunt other players pull for popularity, but as a duty towards society. Even around the pitch, he has never liked discussing his uncountable records. The humble man holds records like highest number of international centuries and most number of runs scored along with hundreds of other accolades. Still he never dismisses the fact that the records don’t matter. What matters is that he loves playing the game and will do so until he pleases. Being one of the highest paid athletes in the world, one would expect him to live the good life the snobbish way. Again, the ‘Sharjah ka hero’ opens his bag of surprises and shows the world how simple living is done without being a person people would look upon just because of his standard of living. Never being involved in a sledge and not even responding to the meanest of comments on the field shows the composure and character the man has groomed throughout his career. “Every day is a new day and you learn new things every day” is what he had said when asked about his experience in sharjah when he made an overwhelming 143 in a desert sandstorm. His team-mates look up to him for advice and so do players from other cricketing nations. Being involved in a ball-tampering case was the one of the lowest points in this great player’s career. He was accused of tampering the seam of the ball which he later broke out of and convinced the world that it was a misunderstanding. Navjot Singh Siddhu once commented on a talk show regarding this very topic. He had said “Aap hindustaan mein Prime minister ko katghare mein tehra sakte ho, lekin Sachin Tendulkar pe ungli nahi utha sakte”. Such is the belief he has instilled into every cricket lovers heart. Even recently, he showed us why the game is called a gentleman’s game and walked away when the umpire declined that it was out. The man teaches us all how to work hard, care, rectify mistakes, be determined and dedicated. The man teaches us how to live. The man gives us a reason to respect him and respect others. Limited number of words is simply not enough to explain the gratitude, I, like millions of other Indians have towards this man. Sachin Tendulkar. Please don’t ever go. This is a Guest post by Sushil Chandekar. He is a student ar the Manipal Institute of Technology, Manipal. His favourite Quote includes the one by The Joker – “Madness is like gravity.all it takes is a little push”.